You’ve got an impending meeting. The outcome of the meeting is likely to have a significant impact on your business, so naturally you want everything to run smoothly and the meeting to be a success. One of the first things you need to do in preparation for the gathering is to book a meeting room. Of course like offices in general, meeting rooms vary considerably in size, style and what facilities they offer. In order to book the right meeting room for your event you will need to consider the following points. When is the meeting room available? Before you send out invitations to your event, it is wise to check availability for the meeting room to ensure it is vacant for the dates you want. Only once the meeting room hire is confirmed should you then send out invitations. The cost of meeting rooms vary considerably depending on the size of the room and the features and facilities it includes. Presumably you have a budget for your event that you need to stick to. Being aware of the cost of the meeting room will help you stay on target for not exceeding your budget. 3- What does the price include? When you are researching the costs of different meeting rooms you should find out what is included in the price. For example, meetings are made a lot more enjoyable and even productive when delegates break for refreshments. Ask therefore, whether tea and coffee is included in the price or whether you will need to pay extra for refreshments and other important meeting facilities. 4- What equipment can be provided? Will your meeting require an overhead projector? Will it require Wi-Fi access? Instead of leaving these important features of a convention to the last minute, make sure the meeting room provider stipulates what equipment can be provided. 5- Is there a disabled entrance? This is an important aspect of meeting room hire that can often go overlooked. You might not necessary know if any of your guests are disabled. It is therefore important to ensure there is a disabled entrance before you book the room. 6- Can the date be changed if necessary? In the incessantly evolving world of business you never quite know what will come up and if a meeting might need to be changed to another day. It would therefore make sense to know if the meeting room hire can be changed to another date if necessary. 7- What is the cancellation policy? Another important question that shouldn’t go ignored. If you need to cancel the meeting room hire, will you get any of your money back? 8- Can the layout be tailored to your needs? As we wrote in an earlier blog, the layout of different types of meeting rooms is very different with specific layouts catering for specific events. If you require a design that is different to the ‘conventional’ layouts, can the room be tailored to your needs? 9- Is there parking on site? Many of your guests are likely to travel to the event by car. They will therefore need to know if there is on-site parking available. 10- What size rooms are available? 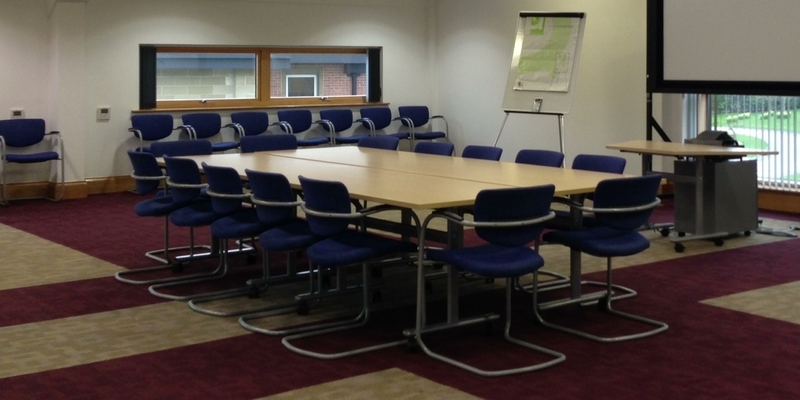 At Carrwood Park we have different size meeting rooms to cater for groups of delegates of varying sizes. You will need to know how many guests you propose to invite to your meeting and book a room designed to cater for this number. 11- Is catering and refreshments available? As we mentioned earlier, breaks offering refreshments is vital for conducting a well-prepared and productive meeting. When booking a meeting room you therefore need to ask whether catering and refreshments are available. It is often important in modern meetings that participants, or at the very least the presenter, has access to the internet. When researching meeting room hire find out whether Wi-Fi is available in the room. 13- Is there air conditioning/heating in the room? Depending on the time of year you conduct the meeting, the room could require air conditioning or heating. Having uncomfortably hot or uncomfortably cold delegates is not desirable – find out whether the room has air conditioning and heating available. 14- Are there any hidden costs? When we book or use any kind of service it is not uncommon for hidden costs to be present that we were not aware of when we ‘signed on the dotted line’. To avoid having to pay for hidden costs that could potentially take your meeting over budget, ask the venue provider to run through exactly what the costs of the room include. 15- How and when is the payment made? Do you pay a deposit? Will you have to pay the remainder of the bill prior to the meeting or after it has taken place. Can you pay by credit card and in instalments or do you have to pay upfront in one lump sum? The payment procedure is an important component of meeting room hire and one you should be informed of prior to making a commitment. 16- Are there any good road or transport links? One of Carrwood Park’s greatest assets is the fact it has fantastic transport links to Leeds City Centre, the M1 and Leeds-Bradford Airport. You may have guests travelling for far and near and good road and transport links will ensure they attend the meeting with greater ease and efficiency. The accessibility of your meeting room venue is therefore an important point to consider. 17- Are there any breakout areas? Breakout areas can be a great way for colleagues and delegates to mingle, network and relax. Having refreshments in a breakout area looks professional and can help improve the overall productivity of the meeting – another important question to ask prior to booking a venue! 18- Will there be help on site? For anyone running a meeting, dreams (or nightmares) in the run up to the event about technology letting you down and the coffee turning up cold, are not uncommon. Having on-site support like IT staff and caterers can help your event run more smoothly and is consequently an important point to consider prior to booking the meeting room.Now it’s time to say goodbye and wrap up your post. Remind your readers of your key takeaway, reiterate what your readers need to do to get the desired result, and ask a question about how they see the topic to encourage comments and conversation. Don't forget to include a Call-to-Action! For professional and well-facilitated meeting room hire close to Leeds City Centre that caters for a diverse range of groups and events, get in touch with Carrwood Park. From innovative startups to large, established corporations, we have worked with a wide range of organisations during our seven years of providing high-quality office space.